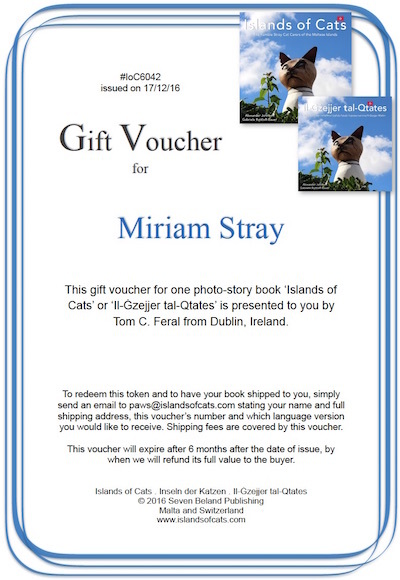 Want to surprise a friend or loved one with 'Islands of Cats', 'Inseln der Katzen' or 'Il-Ġzejjer tal-Qtates'? Looking for a last minute present for an animal lover? Go to the "Buy Now" field of the language of your choice, add the recipient's name in the text box, and pay through PayPal for one printed book as well as shipping fees for the region the recipient will have the book shipped to. We will send you the Gift Voucher in PDF format by email for you to print at home, or to send by email or social media. To redeem the voucher, the holder of the voucher will simply email the gift voucher or voucher number along with the shipping address to us and the book will be on its way. Instructions are included in the gift voucher. book will come in English. We ship* by standard post from Malta (weight per book 570 gr. netto) plus shipping fee. *No shipping between Christmas and New Year. Follow this link for all shipping details. 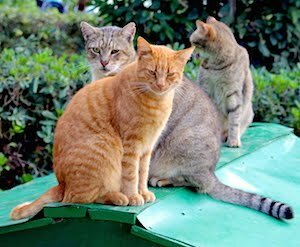 Part of the proceeds of each book sold will be donated in aid of neutering and spaying of stray and feral cats in the Maltese Islands.